Using data available to us, along with your experiences as providers we will be answering some important questions. This will be a rich meeting as we take a good look at these issues and begin discussions around solutions! While we (Fayette County) are rich in resources are there services/programs still lacking or are they not as accessible as they need to be? Those are things we will be looking at Monday, September 28th. Please plan to attend and be a part of this strategic process that will help to keep our kids healthy and safe, our youth to stay in school, graduate and have good opportunities for their future. Please RSVP by Friday, September 25th for lunch and material count. FACTOR Collaborative meetings are held the 4th Monday of each month at Grace Church. Next meeting is August 24th!!! Your input is needed for how/where to get this valuable information out into the community! FACTOR General Collaborative May Meeting May 18th @ Grace Evangelical Church -164 Flat Creek Trl Fayetteville11:30am -lunch and networking / program starts at noon. AVPRIDE will provide lunch and our program. Click here: RSVP by Friday COB May 15. AVPRIDE is working with young people 16 years to 24 years that are low income and have a barrier to education, including basic skills deficient, drop out, homeless, pregnant or parenting, incarceration. They provide –free of charge- a program that includes occupational skills training, tutoring and help with GED, internships-paid and unpaid, and work to assist with employment in their field of interest. Join us Monday, May 18th to learn more about how to refer your clients that are 16-24 years, not in school and not employed. 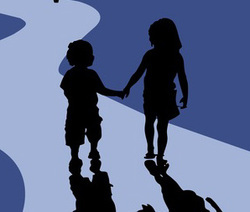 PCA Fayette will be presenting "APRIL IS CHILD ABUSE AWARENESS MONTH-DID YOU KNOW..."
We each play a part in promoting the safety and well-being of children and families in our communities, one of the best strategies for preventing child abuse and neglect. To do this, we need to understand the protective factors that support safety and well-being in families and help parents - who might otherwise be at risk of abusing or neglecting their children - find resources, supports and coping strategies that allow them to parent effectively and protect their children, even under stress. Nurturing and attachment - When parents and children have strong, warm feelings for one another, children develop trust that their parents will provide what they need to thrive. Knowledge of parenting and of child and youth development - Parents who understand how children grow and develop and know the typical developmental milestones can provide an environment where children can live up to their potential. Parental resilience - Parents who are emotionally resilient have a positive attitude, creatively problem solve, effectively address challenges, and are less likely to direct anger and frustration at their children. Social connections - Trusted and caring family friends provide emotional support to parents by offering encouragement and assistance in facing the daily challenges of raising a family. Concrete supports for parents - Parents need basic resources such as food, clothing, housing, transportation, and access to essential services that address family-specific needs (such as child care, health care, and mental health services) to ensure the health and well-being of their children. 6. Social and emotional competence - Children with the ability to positively interact with others, self-regulate their behaviors, and communicate their feelings have relationships that are more positive with family, friends, and peers. Children without these competencies may be at greater risk for abuse. 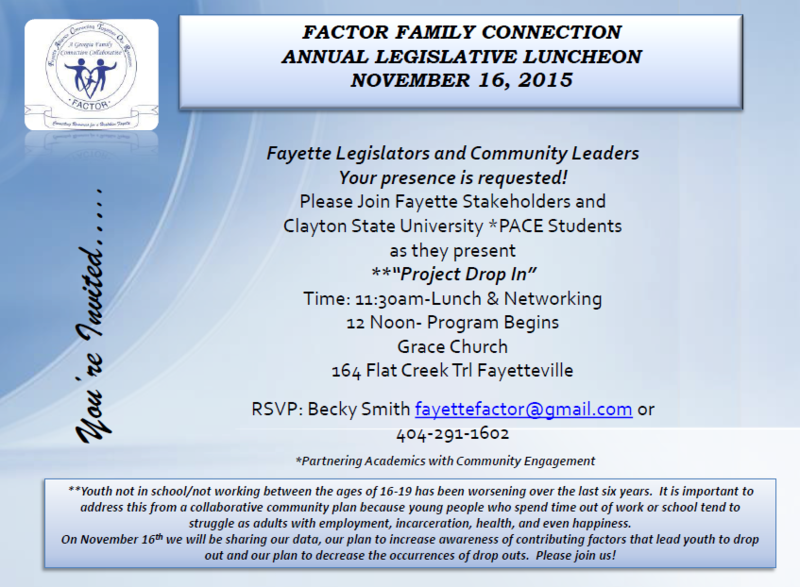 Please RSVP for meeting attendance to fayettefactor@gmail.com . 11:30 am lunch & networking begins- program starts at noon. Our guest speaker, Lisa Janak Newnan, Public Affairs Officer from GEMA will be sharing important information for the families we serve and our own for safety preparedness. Please RSVP by Friday, August 22nd for an accurate lunch and materials count. April is Child Abuse Prevention Month- FACTOR Collaborative Meeting will highlight agencies and organizations that are front line in protecting children.